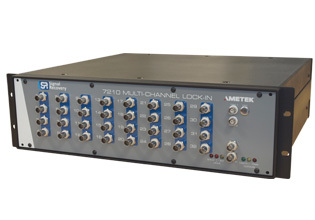 The Model 7210 Multichannel Lock-in Amplifier is yet another example of the innovation and product development provided by Signal Recovery. This unique instrument is the first multichannel lock-in amplifier of its kind. The design concept of the Model 7210 revolves around the idea of a single excitation signal combined with a multitude of detectors. So, the Model 7210 represents an economical solution compared to using a multitude of expensive amplifiers to work with each detector. All outputs are for each of 32 channels. Outputs can be read directly on receipt of a command, or stored on receipt of a GPIB trigger or the GET command for later readout. The output values can be read using commands generating binary or ASCII responses. Instruments can be interconnected to provide more than 32 detection channels. Interconnections are via RG45 multipole connectors. Each instrument has a rear-panel switch to select whether the connectors function as outputs, in which case the unit is the "master", or inputs, when the unit is a "slave". Command Set ASCII commands for all instrument controls and data readout. In view of the specialized nature of this product, the model 7210 is currently available in 8 different configurations to meet individual requirements. When more than 32 channels are required then multiple systems can be supplied with 1 meter long interconnecting GPIB and reference link cables. Each instrument is of course supplied complete with a comprehensive instruction manual containing full programming information.